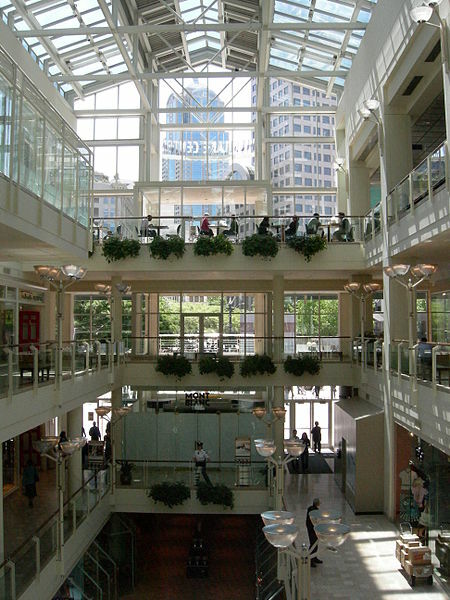 One of Seattle’s main thoroughfares, Westlake Center is composed of a 25-story office building, a 4-story glass enclosed shopping mall and a park that offers a myriad of dining, entertainment and shopping opportunities. The 11,000 square meter commercial complex is named after Westlake Avenue which is at the north part of the mall and goes all the way down to Pine Street with several parking options as well as direct access to the Seattle transit tunnel and Monorail. Being Seattle’s main shopping district, it draws thousands of locals and tourists each day. The district is home to many top name brands and stores surrounding the main mall including Nordstrom, American Eagle Outfitters, adidas, Abercrombie & Fitch, Banana Republic, Cartier, Diesel, GAP, Gucci, Louis Vuitton, Nine West, Nike Town, Tiffany & Co. and many more. Shoppers also have access to all kinds of dining experiences from casual to upscale. The complex is also the transportation hub of the city with access to major public transport systems. The shopping center is right across from Seattle Center Monorail’s southern terminus on Pine Street as well as the South Lake Union Streetcar. Beneath the mall, commuters also have direct access to the Downtown Seattle Transit Tunnel. The mall is also a stop for Metro Buses and Sound Transit’s Link Light Rail. The Westlake Center is more than an office and shopping district, over the years it has evolved into the city’s town square of sorts. Apart from being a prime shopping destination, the mall balcony is a favorite spot for many politicians and celebrities making speeches or appearances. It is also the site of the annual Thanksgiving Day Parade and was also the site of the iconic Occupy Seattle protest. Whether you are looking for something in particular or simply want to browse shops upon shops, you will find the Westlake Center offers many opportunities. More than just shopping, it is also a great place to experience the hustle and bustle of the city. Was there on a Wed night, was hoppin. Just people watching and karaoke. Had a good time. Too good of a time actually!